This is one of our premium range of dog breed specific gift ideas. 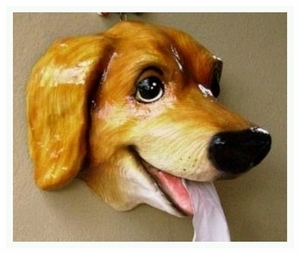 At first glance you see a generously sized porcelain home decor wall ornament in the friendly form of a handpainted Golden Retriever. What your house guest will discover to their delight is that it is also tissue paper dispenser that doles them out from the most unexpected (but still polite) places.